Dr. Yewon Choi received her M.D. from Seoul National University College of Medicine, South Korea, and is training in the Department of Clinical Pharmacology and Therapeutics at Seoul National University Hospital. 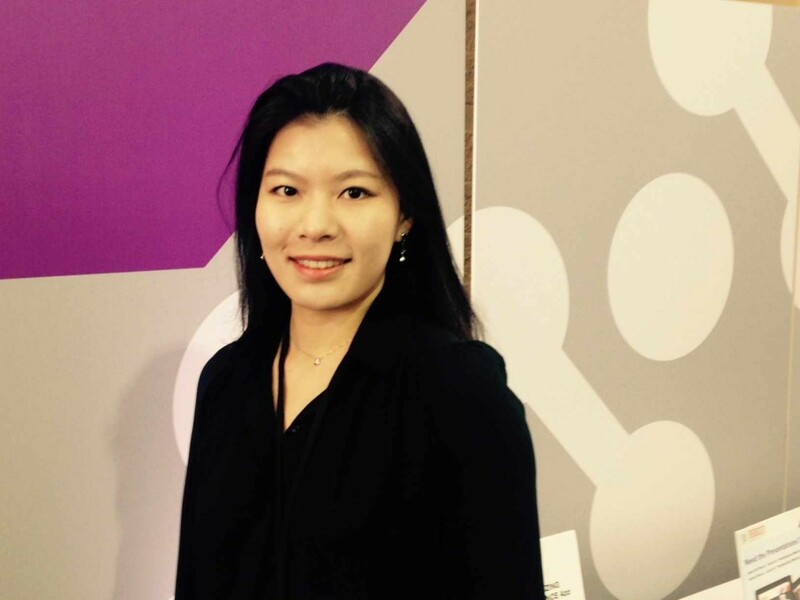 Currently, she is doing her research as a Ph.D. candidate at Seoul National University College of Medicine. Her research focuses on ways to investigate why drug response varies when the same dosage of a drug is administered to patients. Studies on genetic polymorphisms and single nucleotide polymorphisms, frequently called SNPs (pronounced “snips”), can help physicians prescribe the appropriate dose to individual patients according to their genetic variance and disease status. 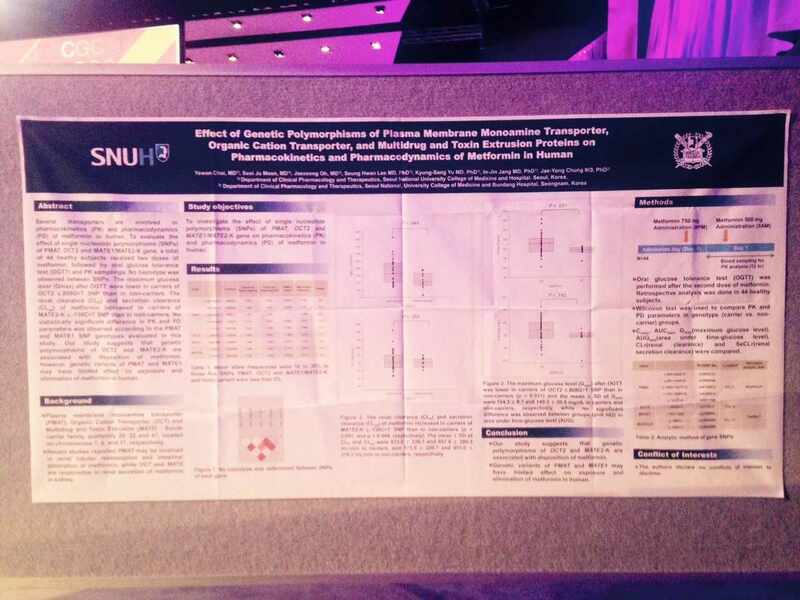 Dr. Choi’s poster for the Individualizing Medicine Conference 2015 highlights several transporters that transport or pump the anti-diabetic drug metformin molecule, controlling absorption and excretion of metformin in intestine and kidney. Genetic polymorphisms of the transporters are responsible for the difference of drug response in patients. In her research, Dr. Choi analyzed nine polymorphisms in four transporter genes, and discovered two genotypes to be responsible for the disposition of metformin and its glucose-lowering effect. She expects to find out more relevant genetic characteristics to predict individual drug response in advance. Here is the complete abstract from Dr. Choi’s Featured Poster of the Day for the Individualizing Medicine Conference 2015: From Promise to Practice. Among various human solute carrier transporters, plasma membrane monoamine transporter (PMAT) may play important roles in renal tubular reabsorption and intestinal absorption of metformin, while organic cation transporter (OCT) and multidrug and toxin extrusion (MATE) transporter are responsible in renal secretion of metformin in kidney. The aim of this study was to investigate the effect of single nucleotide polymorphisms (SNPs) of PMAT, OCT2 and MATE1/MATE2-K gene on pharmacokinetics (PK) and pharmacodynamics (PD) of metformin in human. A total of 44 healthy subjects received two oral doses of metformin 750 and 500 mg tablets with 12 hours of dose interval. We evaluated PKs and anti-hyperglycemic effect of metformin using an oral glucose tolerance test (OGTT) after the second metformin dose. PMAT gene SNPs [c.883-522A>G (rs2685753), c.883-144A>G (rs3889348), c.1450+1047T>C (rs4720572), c.1451-858A>G (rs4299914) and c.*313T>A (rs6971788)], an OCT2 gene SNP [c.808G>T (rs316019)], and MATE1/MATE2-K gene SNPs [c.922-158G>A (rs2289669), c.-396C>T (rs34834489) and c.-130C>T (rs12943590)] were analyzed using SNaPshot® (PMAT) and TaqMan® (OCT, MATE) method. Wilcoxon two-sample test was used to compare PK and PD parameters in genotype (carrier vs. non-carrier) groups. Minor allele frequencies were 10 to 35% in the evaluated SNPs. No haplotype was determined between SNPs. The maximum glucose level (Gmax) after OGTT was lower in carriers of OCT2 c.808G>T SNP than in non-carriers (p = 0.031) and the mean ± SD of Gmax were 134.3 ± 9.7 and 149.2 ± 20.5 mg/dL in carriers and non-carriers, respectively. The renal clearance (CLR) and secretion clearance (CLse) of metformin increased in carriers of MATE2-K c.-130C>T SNP than in non-carriers (p = 0.051, and p = 0.044, respectively). The mean ± SD of CLR and CLse were 813.0 ± 339.7 and 657.6 ± 286.3 mL/min in carriers, and 571.5 ± 220.7 and 451.0 ± 219.2 mL/min in non-carriers, respectively. No statistically significant difference in PK and PD parameters was observed according to the PMAT and MATE1 SNP genotypes evaluated in this study. Our study suggests that genetic polymorphisms of OCT2 and MATE2-K are associated with disposition of metformin. However, genetic variants of PMAT and MATE1 may have limited effect on exposure and elimination of metformin in human.